In the days following the earthquake and nuclear disaster, in which tens of thousands of people were killed and hundreds of thousands deprived of home and security, I was struck by the bittersweet irony of the legendary Japanese cherry blossoms coming into bloom in the wake of social and environmental catastrophe. This piece uses the Japanese concept of torii, (from tōri-iru, which means “pass through and enter”) which is a gate or archway traditionally found at Shinto shrines. This archway marks the point of transition between sacred and profane space, defining the shrine against the outside world. 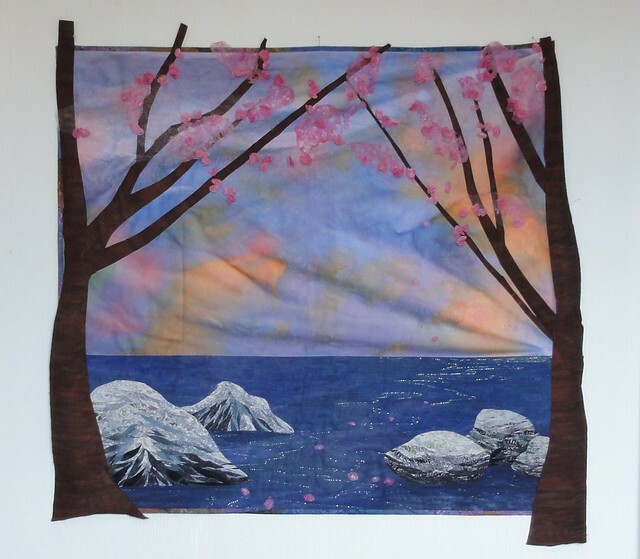 In this piece, the cherry trees form a natural arch through which the viewer looks into the sacred shrine of cherry blossoms and ocean. The arch invites you to “pass through and enter” the piece, leaving behind the chaos of the secular world. Tōri-iru is constructed from cotton fabrics that are hand-painted using light-resistant acrylic-based textile paints. It is both hand and machine-sewn and machine-quilted using an assortment of threads, including cotton, metallic and holographic fibres. 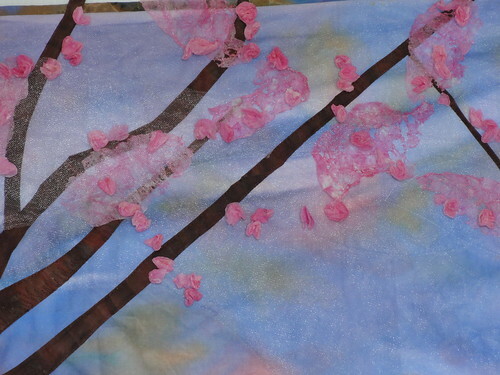 The blossoms are constructed with hand-painted and heat-molded spun polyester fabric. Initially I was planning on having many more blossoms, but the pink blooms became quickly overwhelming, both in colour and texture, so I reduced the number of flowers and added some background sprays of textured pale pink fabric to give the illusion of more blossoms without the bulk. The individual flowers are carefully hand-stitched in place using cotton thread. 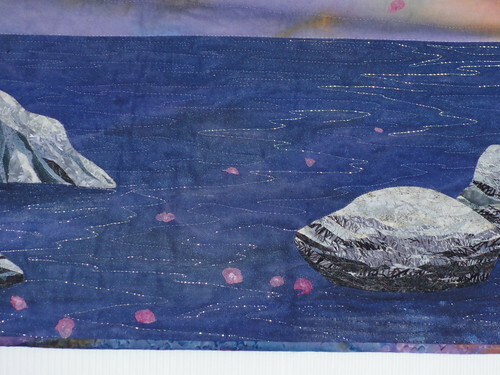 The quilting is designed to enhance the depth and implied movement of the water as well as to ensure excellent structural stability of the piece. The batting is cotton, as is the backing. The piece is mounted on a cotton-covered frame. It is tacked in place, but not stretched, so as to allow the fabrics to fall as they should and to maintain the texture of the surface. Donated to Shakespeare by the Sea for their auction this evening.